I. Pilot Run / Simulation: Even though the design is now complete and a pilot run is completed in the experimental set up, when it is implemented live on the floor there could be some changes in the output. So, before going live, a simulation in the usual factory set up is done. The team should try to use a factory set up (Ex: Layout of machinery) with raw materials, working conditions (Ex: Temperature), machineries and people (Skill level & knowledge) as in real time. All minute changes in the output and any hiccups faced during the process should be recorded. A detailed RCA (Root cause Analysis) should be done and the root causes for variation should be arrived at. II. Make Corrections: Along with the Control recommendations that we arrived at in FMEA (Design phase), the recommendations from this RCA should be added in the FMEA and implemented. It is better to use check sheets, with the list of CTQs and other key things that should be recorded during the simulation. This will help the team to ensure that all aspects of the design are performing as intended and expected. No single aspect will be left out from being monitored, however insignificant it might be. Corrections should be done to the process wherever necessary. III. 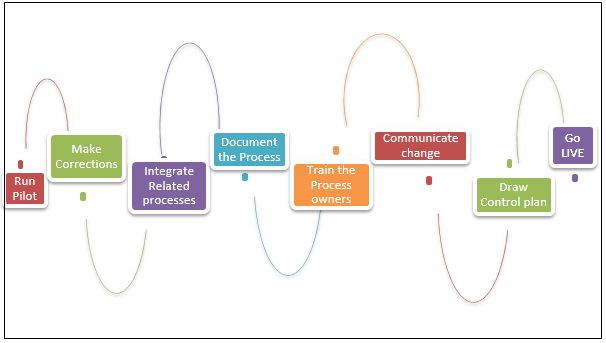 Integrate Related Processes: In case the upstream and downstream processes need modification, to cater to the requirements of the new design, it should be done and a fresh Process flow chart should be created. IV. Document the Process: The process should be documented in the form of Standard Operating Procedures, Process Manuals, Work Instructions, Supplier Manual, Quality Check Manual, Process flow charts, etc. V. Train the Employees & Communicate change: The Implementation plan that was drawn during the Design phase is now implemented. Employees who will be deployed in the new process, upstream and downstream process owners, Quality and training team, should be trained on the new process to be followed. One of the very critical tasks in this step is Change management, which is a challenge faced by many organizations. Depending on the organization culture and employees’ profile, organizations’ choose their methodology of adapting to the change. The new design is now implemented in full scale. VI. Draw Control Plan: A Control plan is drawn to observe any variations in the output. The control plan will have the list of CTQ metrics to be monitored, a list of metrics that could bring out the standard and quality of the input materials and variables, and mid-process performance metrics. Review of these metrics should happen very frequently in the initial phase to identify and fix the gaps immediately. The project team should meet at defined frequency to monitor the progress. VII. Go Live: The process will now go live and is handed over to the operations Lead (the process owner). The transition should be smooth (as mentioned in the Implementation plan). He should be provided with the complete background of the design and the FAQs. This is the reason why the process manuals, work instructions should be prepared in full detail. The project documentation should be prepared by listing the activities completed in each phase with the observations. A detailed list of challenges faced and lessons learnt also should be documented. It is advisable that the process owner starts adopting Statistical Process Control for the key metrics, so that it becomes easy for them to track and correct the performance, as necessary. The Control Phase of DMAIC also is similar to the VALIDATE phase in a broader sense. So, the users can also perform the activities from Control phase that are relevant for their project. With this the VALIDATE (otherwise called as VERIFY) phase, the DMADV Project comes to an end. Conclusion: Initially we learnt the different ways of collecting VoCs (Surveys, questionnaires, etc.). We know to identify and prioritize VOCs, VoBs and VoEs with the help of KANO model. We are also equipped with a strong tool (QFD) that can break complex industry requirements into simple CTQs for designing components. We also know to use TRIZ and Six Thinking Hats to design our new process and to detail it using DoE and other tools. And finally we use the SPC (Statistical Process Control) to control the metrics. Now, we are clear of how and what activities we should do in a DMADV project. DMADV is a very useful tool as it helps us with designing a new process that will exceed our customers’ requirements. Also, it is quite evident that meeting and exceeding a customer’s requirements is a magic that we know how to use and delight our customers. The project lead and the sponsors should pay attention to all these challenges and ensure the project is on the right track. We hope that the article was helpful in providing you with a fair idea on DMADV methodology. We wish you success in using this methodology and improving the customer satisfaction and performance of your organization.